An Australian UFO hunter has reported sighting what he describes as an “alien megastructure” hovering in the sky over Melbourne in Australia. UFO Lou reports in a YouTube uploaded online on November 13, 2015, a massive triangle UFO hovering in the night sky over Melbourne. According to the prolific UFO hunter, the “alien megastructure” was static in the sky. It appeared in the sky and remained visible for a few minutes before vanishing completely. The YouTube documentary sparked an online debate about the nature of the “alien megastructure” UFO. Some YouTube users were convinced that the UFO was a physical object hovering in the sky over Melbourne. But UFO Lou suggested it was probably an optical phenomenon. “Can’t rule out the possibility of some kind of reflection,” UFO Lou writes. 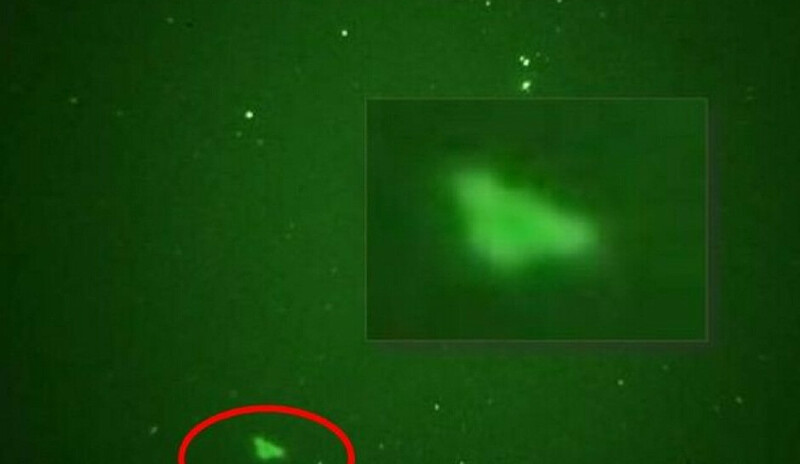 But many viewers thought it was likely a physical “cloaked” UFO that “uncloaked” suddenly. “Cloaking” is the alleged technology used by aliens to camouflage their spacecraft so that they are able to operate undetected in our atmosphere. A method that aliens allegedly often use to “camouflage” their spacecraft is by simulating the clouds. UFO Sightings Daily editor Scott Waring also appears to think that it was a physical UFO hovering in the sky over Melbourne. He notes that the “alien megastructure” was a massive triangle and remarks that the design of the edges of the wings proves beyond doubt that the object was of intelligent design — an alien mother ship. Since astronomers announced last month that NASA’s Kepler’s Space Telescope may have detected a strange pattern of dimming that could be evidence of an “alien megastructure” built near or around the star KIC 8462852 — about 1,500 light years away from us — by extraterrestrials, online UFO bloggers have been reporting sightings of “alien megastructures” too. Waring, for instance, reports sighting an “alien megastructure” using Google Sky near NGC 5462 (Coordinates: 54.397936° 30.913468°). According to Waring, the megastructure is an alien space station that consists of well-formed cubes. The symmetry of the cubes gives clue that the “megastructure” is of artificial construction. “The structure is made of many cubes, and its size is hard to predict depending how close it was to the camera and how far from the surrounding planets,” Waring writes. But following the excitement over the possibility of an “alien megastructure” stationed near star KIC 8462852, Search for Extraterrestrial Intelligence (SETI) announced that it used the Allen Telescope Array (ATA) to examine the vicinity of the star for narrowband and broadband signals, and they were unable to detect any “clear evidence” of signals suggestive of intelligent life. Failure to detect possible signals from an intelligent civilization has forced astronomers to focus more on alternative explanations, such the presence of a swarm of comets orbiting the star.